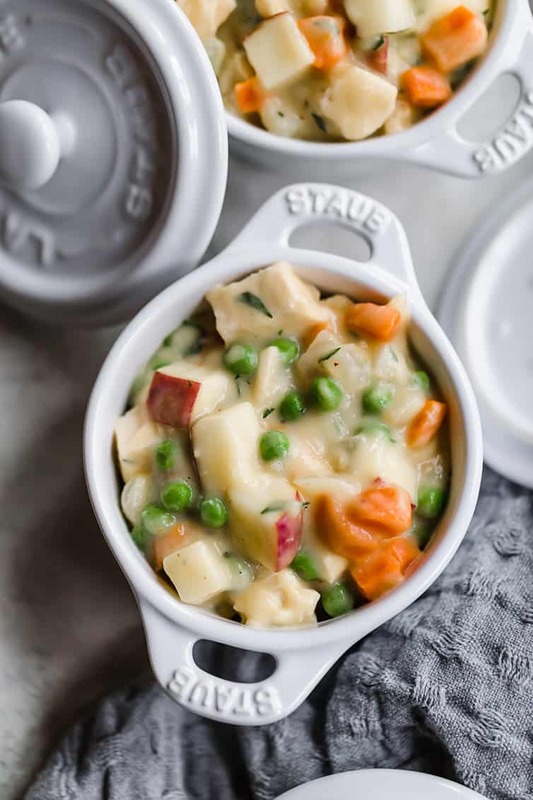 This classic Chicken Pot Pie recipe starts with a creamy filling full of chicken, potatoes, carrots and peas, and is topped with homemade pastry crust. Absolute comfort food at its finest; make it for dinner tonight! Chicken pot pie really is one of the ultimate comfort food dishes, is it not? 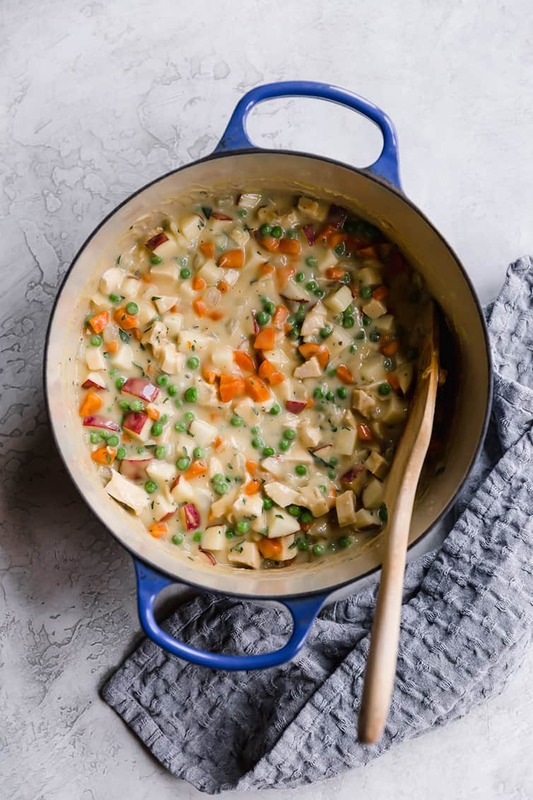 A creamy filling full of chopped chicken, carrots, potatoes, and peas topped with a homemade crust that is so buttery and flaky it melts right in your mouth. This is a stick-to-your-ribs type of meal that tastes so incredibly good going down. 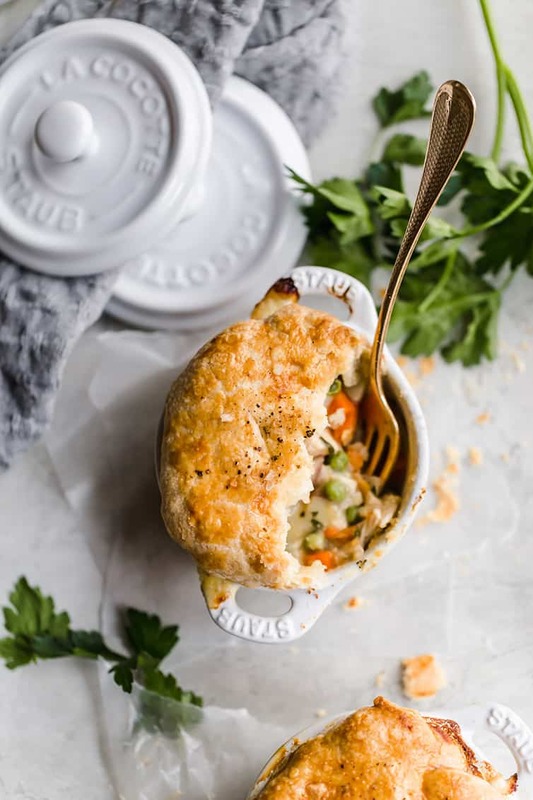 I was first introduced to making chicken pot pie at home with a quick and easy version my grandma shared with me probably 15 years ago, using a frozen veggie mix and Bisquick for the crust and filling. It is DELICIOUS, but I started to crave a truly homemade version a few years later, and found a decent one with a puff pastry topping. Still not totally and completely satisfied, I wanted a thick and creamy filling with a totally homemade pastry crust on top. I am thrilled to tell you that THIS is the absolute best chicken pot pie I have ever tasted! There are two main components for chicken pot pie: the crust and the filling. Let’s discuss! 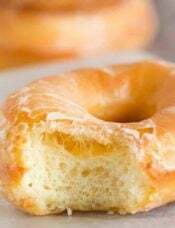 The Crust – This crust recipe is super flaky, yet sturdy enough to stand up to the creamy filling below. 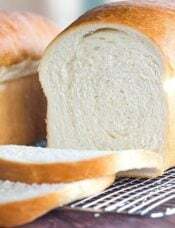 It’s a pretty standard crust recipe, using flour, salt, butter, shortening and ice water, but with one key addition – baking powder. This one little twist gives the crust a bit of lift and really transforms it into a next-level crust you are going to be thinking about for dayssssss. Sauté the onion and carrots – Sautéing onions at the start of a recipe is pretty typical, but I added in the carrots as well to give them a jump-start on cooking and keep them from being too al dente when the pot pie was done baking. 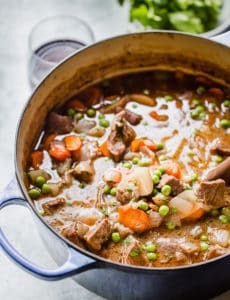 Make a simple roux – Once the onion is translucent, flour is stirred into the vegetable mixture to coat everything and prime the mixture to be thickened. Chicken stock – This is the liquid we need for the roux to come together into a beautiful, silky sauce. Stirring it in slowly ensures that the sauce will thicken nicely and without lumps. A tiny bit of heavy cream gives it an extra punch of lusciousness. Add the flavor – Season with salt and pepper, then stir in the chicken, potatoes, peas and parsley. I love the varied flavors and textures that all of these ingredients provide. 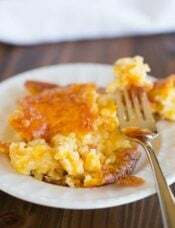 Put it all together – Transfer the filling to a casserole dish or individual ramekins (for a main dish, I think 10 to 12-ounce ramekins work best! ), then roll out the dough and place it on top of the filling. Brush it with an egg wash and sprinkle with flaked sea salt and pepper. Bake until the crust is beautifully browned and the filling is bubbling. Let it rest for a bit so the filling sets up and doesn’t run too much, then dig in! While this recipe doesn’t take too long to assemble (and comes together even more quickly with store-bought rotisserie chicken! ), be sure to check out the make-ahead notes for some tips! A few quick tips and tricks to make this your best chicken pot pie ever! The vegetable shortening in the crust can be substituted with an equal amount of butter, if desired, but be aware that it will change the texture of the crust slightly (it will be slightly less tender). 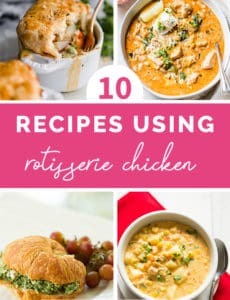 I cut up one whole rotisserie chicken for this recipe, which yielded approximately 1 pound of cooked meat. To save on prep time, you can substitute frozen vegetables for the fresh vegetables. Simply stir them all in with the chicken in step #4. You can use different types of potatoes; I used red since they tend to keep their shape and not get mushy when cooked. Feel free to swap out different vegetables to suit your tastes. 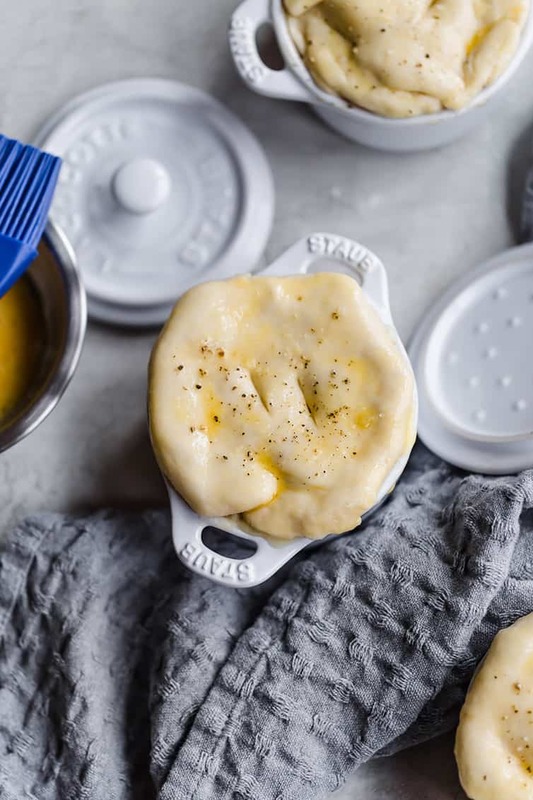 You can make individual pot pies by using 10 to 12-ounce ramekins (you will yield about 8 to 10 pot pies depending on the size you use). Divide the dough into the number of ramekins you have, then roll into a circle about 2 inches larger than the diameter of your ramekin (i.e. if it is 4 inches across, roll the dough into a 6-inch circle). Proceed with the rest of the recipe as directed. Make-Ahead and Freezer Notes: The filling and the pastry can each be made ahead and refrigerated (separately) for up to 2 days before assembling and baking the pot pie. They can also be frozen as follows – place the filling in an airtight container and place the plastic wrapped pastry dough in a freezer bag; both can be frozen for up to 2 months. 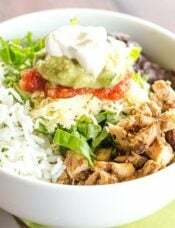 Winter is still hanging on here, so warm and cozy comfort food is still on the menu! 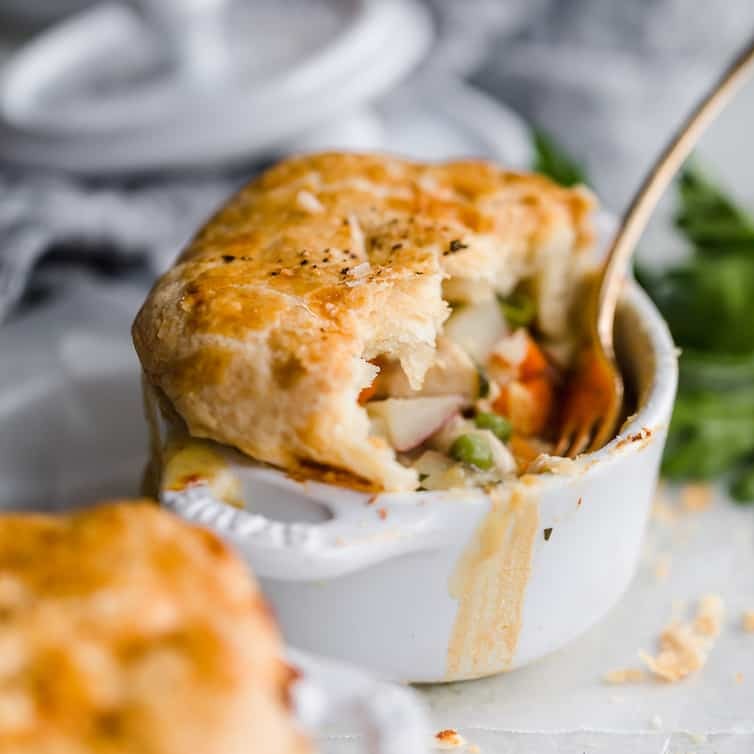 If you’ve ever found yourself thinking that chicken pot pie from scratch is too time-consuming or difficult, please, please, please try this recipe! It’s simple and satisfying and utterly delicious. Make the Pastry: In a large bowl, whisk together the flour, salt, and baking powder. Add the butter and shortening and cut into the dry ingredients until the mixture is no larger than the size of peas. Sprinkle the ice water over the mixture and, using a rubber spatula, fold and mix until the dough comes together into a rough ball. Turn the dough out onto a lightly floured surface and knead lightly into a cohesive ball. Wrap in plastic wrap and refrigerate for at least 30 minutes while the filling is prepared. Make the Filling: Place the chicken stock in a small saucepan and warm over low heat. In a large pot or Dutch oven, melt the butter over medium-low heat. Add the onion and carrot and saute until the onion is translucent, 10 to 15 minutes. Add the flour and cook for 2 minutes, stirring constantly. Slowly add the hot chicken stock, stirring constantly, and simmer over low heat until thickened, about 1 minute. Stir in the heavy cream, salt, and pepper. Remove from heat and stir in the chicken, potato, peas, and parsley. 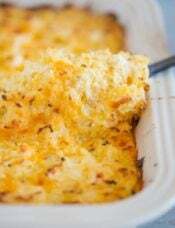 Transfer the filling to a 9x13-inch casserole dish. Assemble the Pot Pie: Remove the pastry from the refrigerator and place on a lightly floured surface. Roll into a 12x16-inch rectangle. Brush the outside of the casserole dish with egg wash, then transfer the pastry to cover the filling. Crimp as desired and press the dough onto the outside of the casserole dish. In a small bowl, whisk together the egg and water for the egg wash. Brush the entire surface of the dough with the egg wash, then cut five slits into the surface of the dough. Sprinkle with flaked sea salt and cracked black pepper. Bake until the filling is bubbling and the pastry is golden brown, about 1 hour. Allow the pot pie to sit for at least 20 minutes before serving. 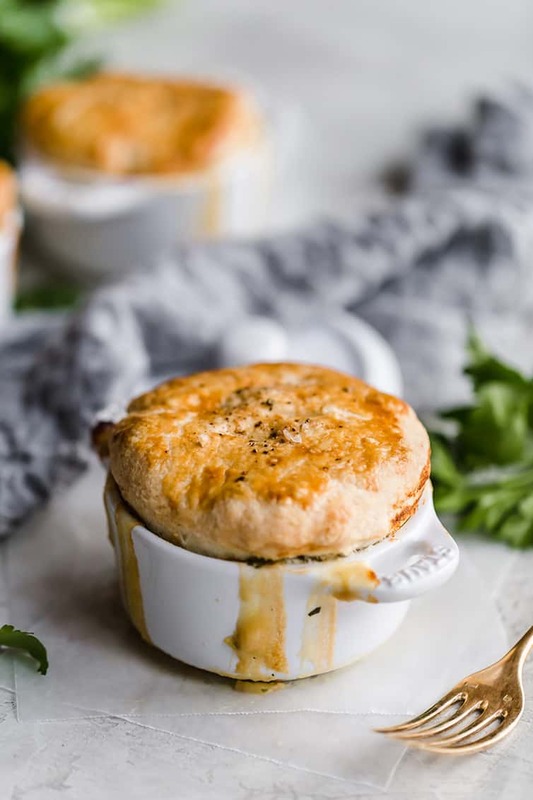 Make-Ahead and Freezer Notes: The filling and the pastry can each be made ahead and refrigerated (separately) for up to 2 days before assembling and baking the pot pie. 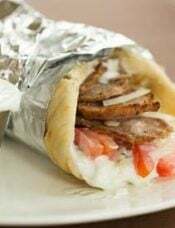 They can also be frozen as follows - place the filling in an airtight container and place the plastic wrapped pastry dough in a freezer bag; both can be frozen for up to 2 months. 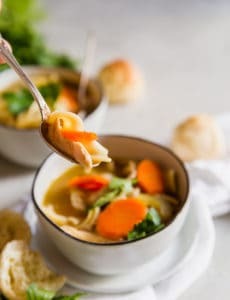 Update Notes: This recipe was originally published in September 2008; it was completely overhauled with a much improved recipe (and new photos) in February 2019. Made it last night at hubby’s request. Only changes I made was to half the recipe (just the two of us) and to add in some red pepper flakes and thyme. Delicious, will definitely make again! Can’t wait to try making this myself! I love that the pastry and filling can be prepped ahead. Comfort food? I’m even comforted just reading this post. Looks amazing. Definitely think my family would enjoy this. 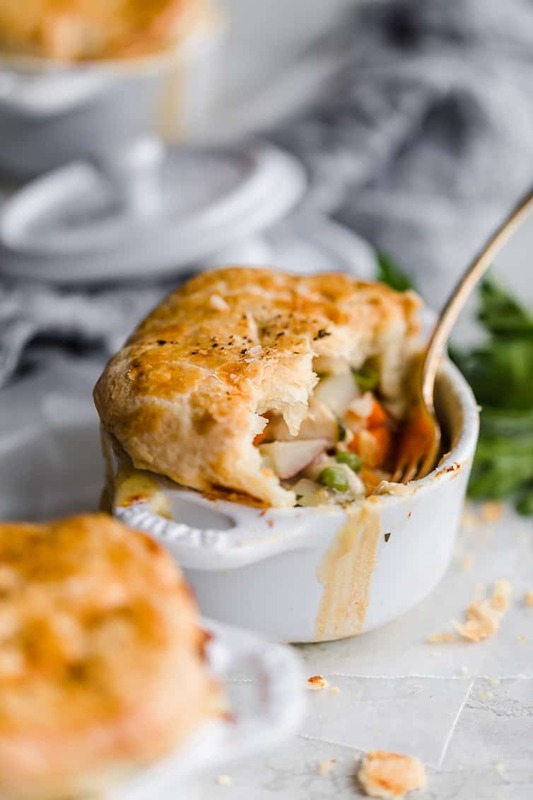 I absolutely LOVE chicken pot pie…reminds me of being a kid. My favorite restaurant version (Atria’s) makes their filling and adds sherry to the cream sauce. It has made a world of difference to the pot pies I make at home now. Try adding some next time you make yours and see if you like it. It really changed the dish for my husband (who was not a fan of traditional chicken pot pie). I make a chicken stew based on Ina’s recipe plus one from Martha Stewart (from her One Pot cookbook). From that I make chicken and biscuits. chicken pot pie and chicken and dumplings (my favorite). They’re all so good!